I just finished Forge, the sequel to Laurie Halsen Anderson’s award winning-book, Chains, and I’ve already left a spot open on my shelves for Ashes, the final installment in Anderson’s Seeds of America trilogy. I may own a Nook, but this is a series I want to have lined up on my shelves so that I can be reminded of the power of good writing and the brilliance of Anderson’s accomplishment. One of the accomplishments of these two novels is how well they weave historical information into the fictional story. I learned so much about Valley Forge in this book. In fact, one of the new books in my “to read” pile is Russell Freedman’s book Washington at Valley Forge. It was Anderson’s story of Curzon and his fellow soldiers that gave me a new appreciation for the men who lived and died during that horrible winter. And how cool is that title – Forge. 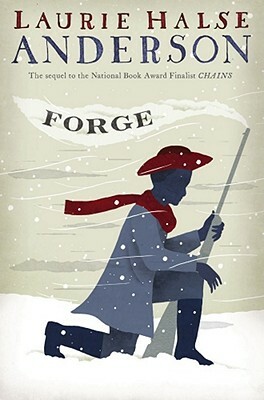 Referring not only to Valley Forge, but to forging an identity and, by the end of the novel, Isabel and Curzon forging a relationship. And, of course, since I finished reading Forge today, it makes me think of Martin Luther King and the bonds he forged between people. I’m planning on reading this book. The first was amazing. I’m looking forward to reading it.